Enjoying a cigar is an immensely pleasurable experience. If done correctly, you walk away from it feeling relaxed and satisfied, much like the feeling you have after enjoying a gourmet meal. Unlike the quick, nicotine-focused experience of having a cigarette, cigar smoking is all about relaxation and taking the time to enjoy the subtleties and flavor of the smoke. ain exactly one ingredient, are never treated with chemicals at any point, are hand-rolled, have wider degrees of nicotine variation, are made specifically for taste, and are often considered a hobby or passion rather than a vice. Let's take another step back here and recognize that there are products misleadingly labeled cigars – Swisher Sweets I'm looking at you – that often come in flavors such as grape and watermelon. These products are machine rolled, cheap, and not what we're talking about here. Real cigars, like the one pictured, are known as premium cigars. They come with strict regulations about how they are produced and come from many different countries. Despite the premium status, these cigars can start as low as $3 and go as high as $100 or more. Consider this when going to a cigar store. Don't think that you have to drop $10 or $20 on a cigar to get the best experience, even if you want something special. Pick a price range you're comfortable with first, then take a look around. Don't worry about names, countries, or types yet. Look at color, and – making sure not to hold the cigar up to your nose – try to get sense of the smell of the cigar. This can be done by examining the box the cigar came from or simply asking someone who works there. Just remember, Gents don't put cigars in their noses. Now that you've selected your cigar you're ready to go. One last option must be considered, however. The clerk will often ask if you want him to cut the cigar for you. This is perfectly acceptable and quite convenient when you're out and about and don't have a cutter. If you want to use a cutter but don't quite know what you're doing, just keep a few things in mind: You only want to cut off the cap. If you examine the head of the cigar – the part that goes into your mouth – you'll notice a small piece of tobacco on the very tip. This is the cap. You'll also see two lines, which are created by two strips of tobacco. You want to cut above the first line; above, meaning closer to the cap. A good cut will result in just a sliver of tobacco, all in one cup-shaped piece, instead of a hunk of cigar like you see on TV. Once the cigar is cut, it's time to light. I like to take a few dry pulls off the cigar before lighting, in order to get the unlit taste of the cigar. There are several ways to light a cigar, but I'll just go over the most basic. Although it's not the most preferred method (due to taste), using a regular, butane lighter will work fine. The important thing to remember is to draw slowly on the cigar as you light it. We're in no hurry here. Spin the cigar in your fingers so that different parts of the foot (the part you're lighting) get equal time with the lighter. It may take some practice, but lighting a cigar is important. The perfect light will leave the cigar burning in a cone shape. After burning down a half-inch or so, when you ash, you should see a cone pointing out from the tip of the lit cigar. This will give you a long, even burn. Finally, there are some subtleties to smoking the cigar itself. The first idea is that you want the cigar to remain as cool as possible. Don't take constant pulls of the cigar; instead, take one or two pulls a minute. Overheating the cigar will ruin the taste and eventually burn your mouth. While cigars are never meant to be inhaled, there is a technique called retro-haling. You pull the smoke into your mouth but exhale out through your nose, without inhaling. This allows the smoke to hit the back of your tongue and throat, where different taste receptors are found. So, in order to get the full spectrum of taste a cigar has to offer, try retro-haling. You don't have to do this every pull of the cigar, but it can be nice to add to the mix occasionally. You can take the paper ring off the cigar or leave it on. The ring is a good indicator of where you should stop smoking the cigar. You can also handle the cigar as much as you want in your mouth. Some people keep the cigar inside their mouth in between pulls and others don't. Some people chew on the end, others don't. A lot of cigar smoking is doing whatever pleases you. 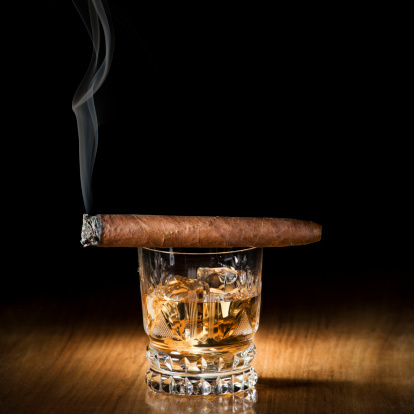 I've outlined some basic concepts about cigar smoking, but I've always said, the best way to enjoy a cigar is to enjoy it however you like it. Thanks for the blog, Ben. As a new member this year, I am looking forward to what I hear is a build out of the 2nd floor (including a cigar lounge potentially) in the Frisco location.